Facebook and Twitter have more than 1 billion active users. More than 3.2 billion “likes” and “comments” are posted on Facebook brand pages each day. And research from ExactTarget reveals that 50% of consumers are more likely to buy after following a brand on Twitter. It's a direct marketer's dream to be able to reach so many prospects and influencers so quickly! No other channel has more ability to attract and influence potential customers than social media. For companies to effectively monetize social media, they must stop measuring success by the number of Facebook likes and Twitter followers they have and start engaging these individuals directly by delivering content that drives purchase. And the best channel for providing relevant information that aids purchase decision-making is email. Amazed at the stats on Twitter and how much I like it more and more everyday! I love that it’s personable. I love how news travels across the world. I love that I can tweet a large organization and get a response from a real person. The brand is interacting with me. As a consumer, I find this form of communication absolutely empowering, and as a student of marketing it’s really quite thrilling. We are in our new office. A shot of the conference room. Still needs pictures and logo on the wall! The two questions I still receive weekly from clients is...1) Is Facebook going away and 2) Is Facebook going to start charging. My answer is always a resounding NO on both accounts. Now that Facebook is going public, they recently revealed their latest statistics for their S1 Filing for its upcoming IPO. Facebook is about to raise $5 billion from investors. 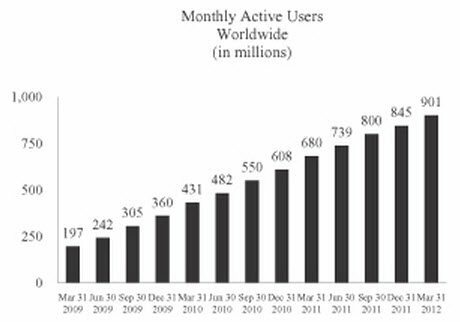 The graph below from Facebook seems apparent that its growth is not slowing anytime soon and with over 7 billion people on the planet it still has a lot of headroom for future growth. With the numbers above and the stats I list below, I am astounded when I see businesses NOT using Facebook to market their business. Some interesting stats from Facebook. One in 7.7 people in the world have a Facebook account.